You can try planting winter bedding plants in beds, borders, containers, window boxes or hanging baskets for a welcome splash of color when few other plants are in flower. 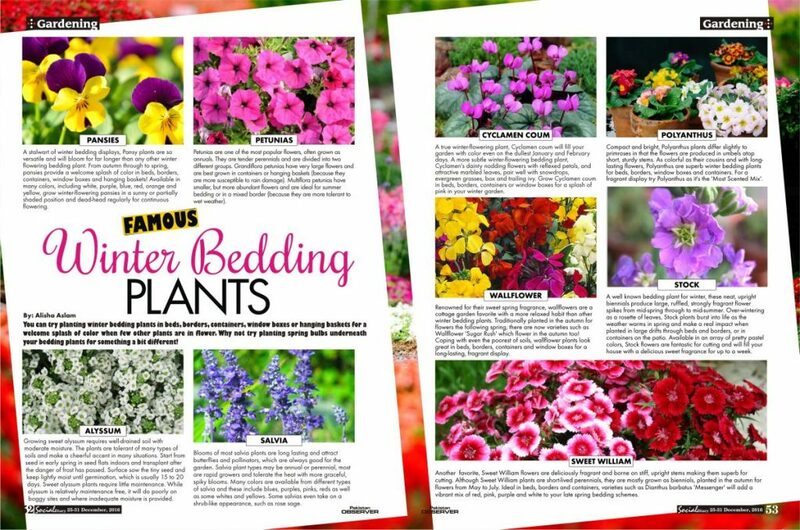 Why not try planting spring bulbs underneath your bedding plants for something a bit different! A stalwart of winter bedding displays, Pansy plants are so versatile and will bloom for far longer than any other winter flowering bedding plant. From autumn through to spring, pansies provide a welcome splash of color in beds, borders, containers, window boxes and hanging baskets! Available in many colors, including white, purple, blue, red, orange and yellow, grow winter-flowering pansies in a sunny or partially shaded position and dead-head regularly for continuous flowering. Petunias are one of the most popular flowers, often grown as annuals. They are tender perennials and are divided into two different groups. Grandiflora petunias have very large flowers and are best grown in containers or hanging baskets (because they are more susceptible to rain damage). Multiflora petunias have smaller, but more abundant flowers and are ideal for summer bedding or in a mixed border (because they are more tolerant to wet weather). Growing sweet alyssum requires well-drained soil with moderate moisture. The plants are tolerant of many types of soils and make a cheerful accent in many situations. Start from seed in early spring in seed flats indoors and transplant after the danger of frost has passed. Surface sow the tiny seed and keep lightly moist until germination, which is usually 15 to 20 days. Sweet alyssum plants require little maintenance. While alyssum is relatively maintenance free, it will do poorly on boggy sites and where inadequate moisture is provided. Blooms of most salvia plants are long lasting and attract butterflies and pollinators, which are always good for the garden. 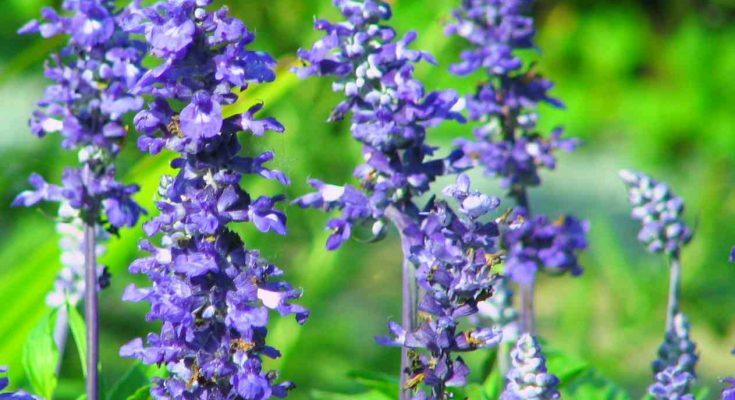 Salvia plant types may be annual or perennial, most are rapid growers and tolerate the heat with more graceful, spiky blooms. Many colors are available from different types of salvia and these include blues, purples, pinks, reds as well as some whites and yellows. Some salvias even take on a shrub-like appearance, such as rose sage. Compact and bright, Polyanthus plants differ slightly to primroses in that the flowers are produced in umbels atop short, sturdy stems. As colorful as their cousins and with long-lasting flowers, Polyanthus are superb winter bedding plants for beds, borders, window boxes and containers. For a fragrant display try Polyanthus as it’s the ‘Most Scented Mix’. Renowned for their sweet spring fragrance, wallflowers are a cottage garden favorite with a more relaxed habit than other winter bedding plants. Traditionally planted in the autumn for flowers the following spring, there are now varieties such as Wallflower ‘Sugar Rush’ which flower in the autumn too! Coping with even the poorest of soils, wallflower plants look great in beds, borders, containers and window boxes for a long-lasting, fragrant display. Another favorite, Sweet William flowers are deliciously fragrant and borne on stiff, upright stems making them superb for cutting. Although Sweet William plants are short-lived perennials, they are mostly grown as biennials, planted in the autumn for flowers from May to July. Ideal in beds, borders and containers, varieties such as Dianthus barbatus ‘Messenger’ will add a vibrant mix of red, pink, purple and white to your late spring bedding schemes. A well known bedding plant for winter, these neat, upright biennials produce large, ruffled, strongly fragrant flower spikes from mid-spring through to mid-summer. Over-wintering as a rosette of leaves, Stock plants burst into life as the weather warms in spring and make a real impact when planted in large drifts through beds and borders, or in containers on the patio. Available in an array of pretty pastel colors, Stock flowers are fantastic for cutting and will fill your house with a delicious sweet fragrance for up to a week. A true winter-flowering plant, Cyclamen coum will fill your garden with color even on the dullest January and February days. A more subtle winter-flowering bedding plant, Cyclamen’s dainty nodding flowers with reflexed petals, and attractive marbled leaves, pair well with snowdrops, evergreen grasses, box and trailing ivy. Grow Cyclamen coum in beds, borders, containers or window boxes for a splash of pink in your winter garden.